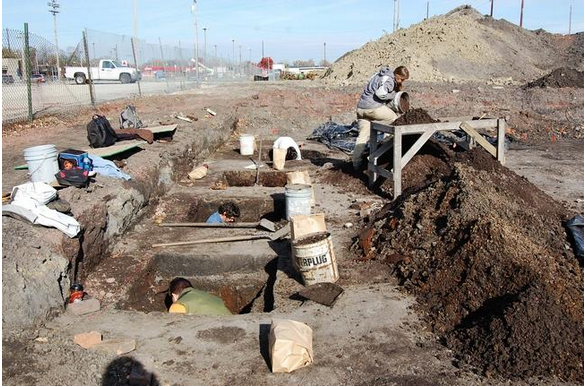 Excavation of near the intersection of Madision and 10th Streets in Springfield as part of the rail relocation project unearthed the remains of seven home sites dating back to the mid-1800s. Photo courtesy Floyd Mansberger. A group of minority lawmakers alleged Thursday that archaeological artifacts uncovered as part of the Carpenter Street railroad underpass project were kept under wraps after their discovery. At a Statehouse news conference, Rep. Al Riley, D-Olympia Fields, referred to what he said was “a conscious embargoing of information” regarding artifacts that were uncovered and linked to the infamous 1908 race riots in Springfield. Riley said “there’s information that was given to me” that the artifacts were discovered in late summer but were not publicly revealed until January. However, Kevin Seals, chief environmental scientist for Hanson Professional Services, the Springfield firm overseeing the project, said the process for determining what to do with the archaeological finds is just beginning. He said workers started doing archaeological surveys for the project in late September and early October. Along with some “minor artifacts,” the foundations of seven homes built in the 1840s and 1850s were uncovered. Further research determined five of the homes were burned in the race riots. Seals said the discovery was reported to the Federal Railroad Administration, the lead agency on the project. A meeting was held last week at the Prairie Capital Convention Center to get input from groups about what to do with the site. “Before we further dig to find out if there is anything of value or interest to various organizations, they need to be notified and a group needs to be pulled together to determine how we further mitigate the site,” Seals said. The options could include continuing to dig, preserving it as is or erecting a marker. “That’s what we want to work with the public on,” Seals said. He said the entire process could take 18 to 24 months before a final report on the findings is completed. The archaeological finds will not delay the project itself, Seals said. The site is south of the underpass and in an area that will be needed for relocated tracks eventually. The underpass is an early step in the long-term plan to consolidate rail traffic on the 10th Street corridor.